Model DS20 Float Type Flow Meters / Flow Switches work according to the suspended-float principle of measurement. The device has a cone-shaped float that moves within a cylindrical measuring tube. The flowing gas or liquid moves the float in the direction of flow. The movement of the float is transmitted magnetically to a dial indicator mounted outside the measuring tube. 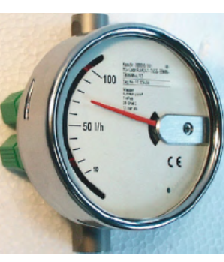 The indicator is fitted with a scale appropriate for the operating range encountered. If necessary, the indicator can also be fitted with contacts or an analog output. Model DS20 flow meters are intended to measure and monitor gases or low-viscosity liquids, such as those found in applications like cooling systems for welding machines, laser and tube systems, pump monitoring, compressors, etc. Since all parts coming in contact with the medium being monitored are made of high-quality stainless steel 1.4571, this device is also suitable for use with caustic / corrosive media.